Back from France, where she participated in the festivities on the occasion of the 50th anniversary of the Chaîne des Rôtisseurs, the head for Lebanon Arlette Mabardi tells us the highlights shared with delegations from 26 foreign countries. She also describes the events that took place in Lebanon on the 5th anniversary of this chain, gastronomic events under the banner of the Lebanese cuisine. 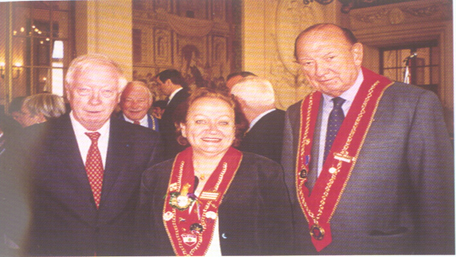 At City Hall, the mayor of Reims Jean-Louis Schneiter, Arlette Mabardi, President of Lebanon, Count Bernard de Nonancourt, President of Reims. Tell us about the Chaîne des Rôtisseurs The Chaîne des Rôtisseurs was born in 1248 at the time of Saint Louis, King of France. The “Oyeurs” (Roasters of geese, poultry appreciated in the Middle Ages) received their armorial bearings in 1610 and for five centuries defended the French culinary art. The revolution in 1793 brought down the corporation, however, the gourmet adventure was revived in 1950 under the leadership of renowned gourmet and the Chaîne des Rôtisseurs holds since then, annual chapters. Currently, over 120 countries are in the influence of the French culinary art. 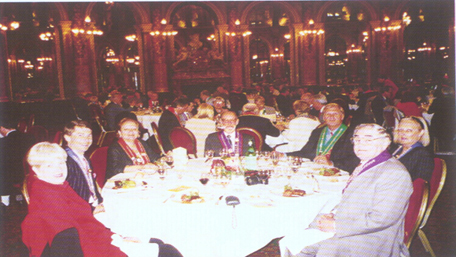 Members of the Chain from around the world meet once a year in Paris, to hold a general assembly, a board and a large lecture section. 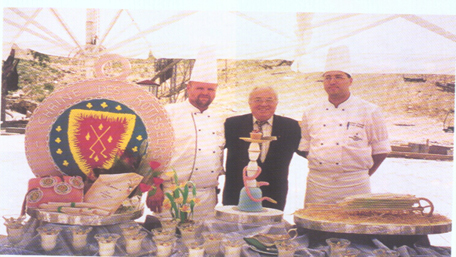 The celebration of the 50th anniversary of the chain that took place in France had a specific taste … The chain opts annually for a specific location in order to organize the meeting. 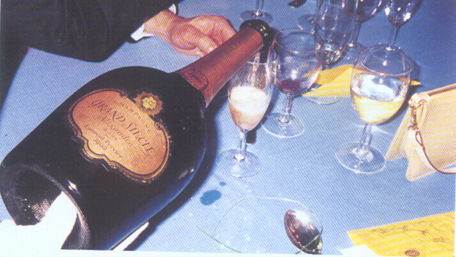 For 2000, the choice fell on Reims in order to celebrate the 50th anniversary of the resumption of the chain in France. As President of the Chain in Lebanon, I took part in various events. At the end of the general assembly which was held in Paris, members of the Chaîne des Rôtisseurs were received at the municipality by Jean-Louis Schneiter, Mayor of Reims. 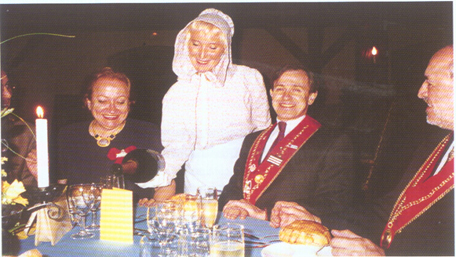 At the dinner, the waitress in traditional dress pours champagne to Arlette Mabardi, to Mr. Cuantro, Cuantro owner and director of the Academy le Cordon bleu. In the presence of His Royal Highness Henri de France, Count of Paris, guest of honor of the chain, a friendly reception in the city of coronations stood out as a prelude to the ceremony of the Grand Chapter of the 50th anniversary that was held at the Episcopal Palace of Tau. The great chapter chaired by the president of Champagne, Bernard de Nonancourt and Robert Baty, Chancellor of Champagne, has inducted a host of personalities from around the world, after appointing the Count of Paris member of the Board of Honor of the Chaîne des Rôtisseurs . Greeted royally by hunting fanfares, participants visited four champagne cellars of Reims where they could enjoy the Laurent-Perrier pink champagne, named Alexandra, designed in a specific manual way and can only be moved under special conditions. A gala evening ended these exceptional festivities. The value of these manifestations certainly resided in the specificity of the place, since for the first time the Grand Chapter of the Chaîne des Rôtisseurs was meeting in Reims, but also in the quality of the guests of value, including the Count of Paris and delegations from 26 foreign countries. The Arab countries were well represented by, in addition to Lebanon, Jordan, Morocco, Kuwait, Saudi Arabia, the United Arab Emirates and Egypt. Lebanese chain brings together professionals and amateurs, what are the different activities you organize during the year? Following the example of all the chains in the world, we prepare an annual induction, details of which are published in journals of Chaîne des Rôtisseurs published in Paris and read by virtually all members of the chain internationally. These reviews also linger on the various programs organized throughout the year in different countries, these informations prove to be ultimately true promoting both tourism and culture. Created primarily to spread the French kitchen, Chaîne des Rôtisseurs, since the resumption of its activities in the fifties, is now interested in international cuisine. That’s why we enjoy the presence of our foreign guests in Lebanon to present our fatness and our national specialties. Moreover, we pledge, in our quality as members of the Chaîne des Rôtisseurs to honor the art of cuisine and culture of the table, as well as our duties of brotherhood and respect in respect of all members. These are among 88 in Lebanon, chosen according to the quality of their food culture. Monthly, we organize a meeting or dinner, this is to choose menus that must satisfy the five senses. Our goal is to taste different dishes offered at restaurants in Lebanon and to publish our assessments in international journals published in editions of 22,000 and distributed all around the world. Lunch of the general assembly of the Grand Hotel in Paris, in the Opera room; representatives of Australia, Lebanon, the Netherlands Antilles, Mexico and the United States. Rosé champagne of Laurent-Perrier Grand Siècle created by the Count of Nonancourt for the new millennium and named Alexandra, after his daughter. The chain in Lebanon has already five years of existence, what were the most important times in the multiple celebrations for the occasion?Present in Lebanon since five years, we organize annually a chapter to which we invite members of the chain in the world. This year, representatives from Egypt, the United States, Belgium, Cyprus and the Grand Chancellor Robert Baty of France responded to the invitation, our program spread over three days was conceived to cover all the Lebanese regions. A superb dinner was given on the first day at Inter-Continental Hotel Mzaar. The pastry chef had a very successful presentation, realizing the logo, ribbons, certificates, and medals of the chain as well as a hookah, all in sugar, he had earned the admiration of all the guests. The typical Lebanese lunch prepared for the occasion and characterized by the specific country food such as cheese, kibbeh, roast or markouk showed the extent of the Lebanese dining experience. A dinner was also offered at Phoenicia, by the former head roaster Marc Lambert who has already five global dinners for roasters. The next day, we took them sightseeing the Jeita Grotto, Mzaar and the ruins of Faqra. During the second day, participants enjoyed the sahlab at Chtaura before heading to Zahle and Baalbeck. Visiting the temples of the city of sun, deep dream of French President proved to be, in his words, even more grandiose then in his most fertile imagination. The Chain members also visited the Ksara caves and stopped at Arabi restaurant to have lunch. A completely sunny stay in the land of cedars. Hotel Intercontinental Mzaar Lebanon, Robert Baty, surrounded by pastry chef and his works in sugar, and the head of the kitchen.